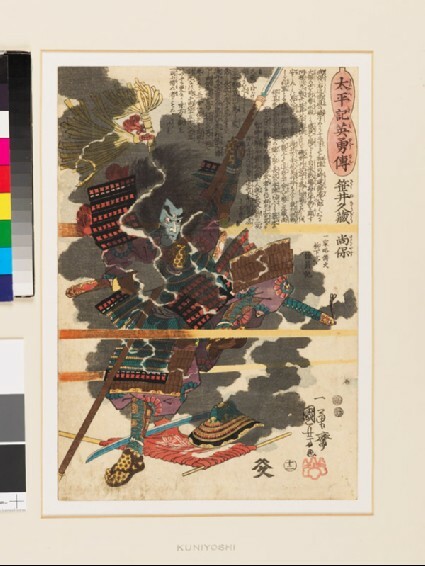 Sakai Kyūzō, 1555-1570, (here Sasai Kyūzō Masayasu) was Masanao's oldest son (see No.14) [EA1971.60]. When he was thirteen years old, he had taken part in his first battle, killing Tatebe Genhachirō, one of the powerful soldiers of the time. 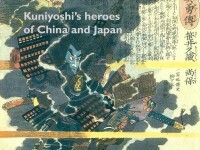 Kyūzō subsequently became one of the Nobunaga's favourite pages. In 1570, Kyūzō at the age of 15, went with his father Masanao to the battle of Anegawa, fought between Oda Nobunaga and Asai Nagamasa. Although Masanao withdrew from the battle, being unable to protect his camp against Asai's attack, Kyūzō fought desperately without retreating. Eventually, he was killed by gunfire as he tried to break into the camp of Nagamasa. This print shows 'Masayasu', enveloped in smoke, mowed down by a volley of musket-fire at the battle of Anegawa.